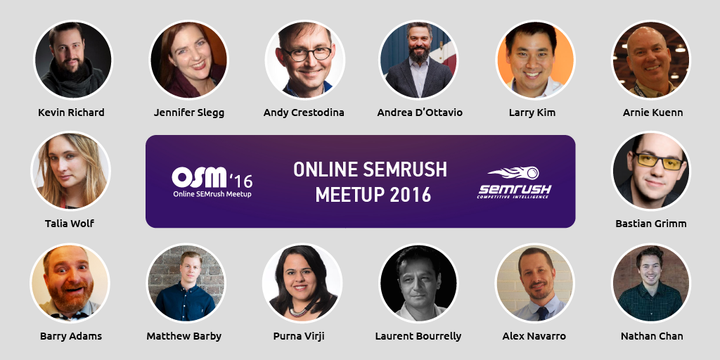 We are proud to invite you to take part in our very first global Online SEMrush Meetup on December 15th. Together with 14 world-renowned digital marketing experts, we’ll take you on a breathtaking journey through the lands of content marketing and finish off with a round-table discussion on the most significant digital marketing trends to look out for in 2017. Enjoy the atmosphere of a live conference while communicating and networking with your fellow digital marketers and experts via Zoom! What’s more? We’re planning amazing prizes for you, including SEMrush Guru accounts. Stay tuned! So what do you say? Ready to embark on the content marketing voyage?